i may add the UAS to my Stance Coils after the cash frees up again from my FI build.. would REEEALY be nice to drive this where i wanted w out it being such a crap shoot. Alright guys i've searched all over the place for anything on air ride on a 350z.... I found nothing on the z side so I went hunting on the G side of our forums. I found this whole article for you guys to use AIR RIDE LINK I'm going air on my Z the same way. I will be doing a how to article at that point probably be a couple months as I buy the components but at least everyone will have more to gauge everything off of. Last edited by nismo4life11; 06-14-2012 at 07:22 AM. I have UAS bags on Function Form shocks. Ride is better than when they were set up as coils. I've been on them for about a month now. Still have small leaks to find. Install wasn't as bad as I thought. Overall very impressed. I do think I'll invest in an autoleveling system though. thought i might throw this up there.. been doing a few installs on my buddies car. Next one up is Matt. 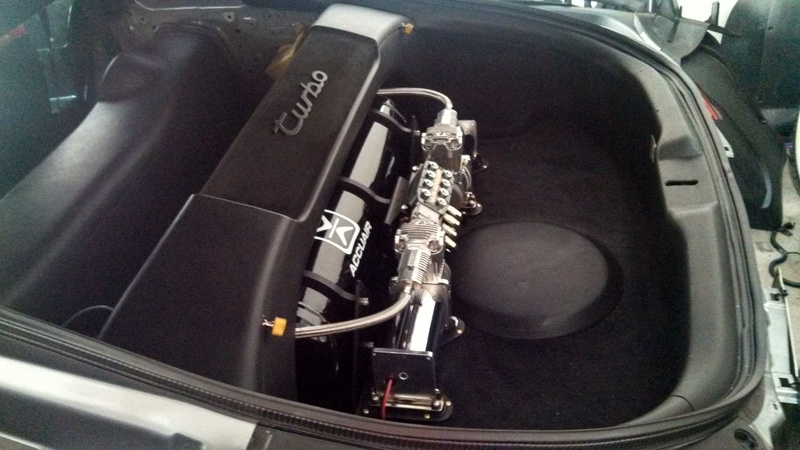 Trunk is stock w/ a sub in the left corner as well as the air tanks and compressors on its own baseboard. We are using k-sport pro plus kit w/ enclosed box.. ride is pretty good but you need a real leveling system to get the rideheight proper. My understanding is that they are expensive, a pain in the ***, and handle like $hit compared to a comparatively priced traditional setup. 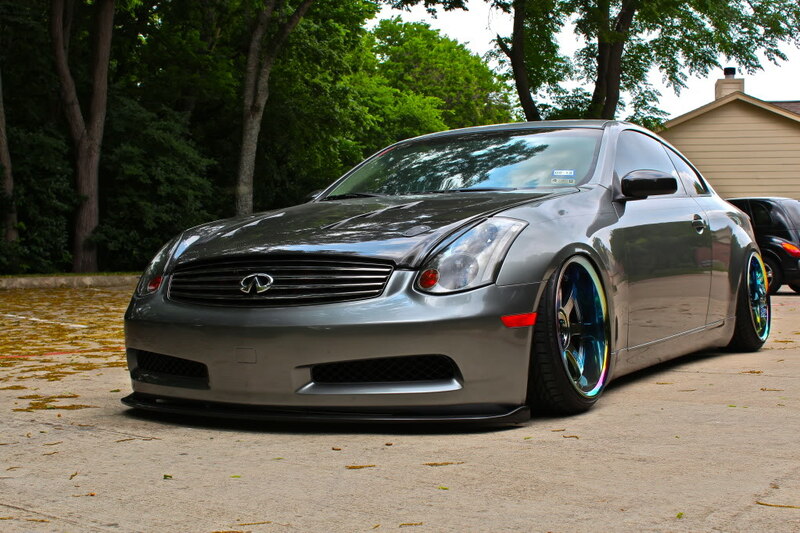 Personally id spend the money on a really nice coilover setup. 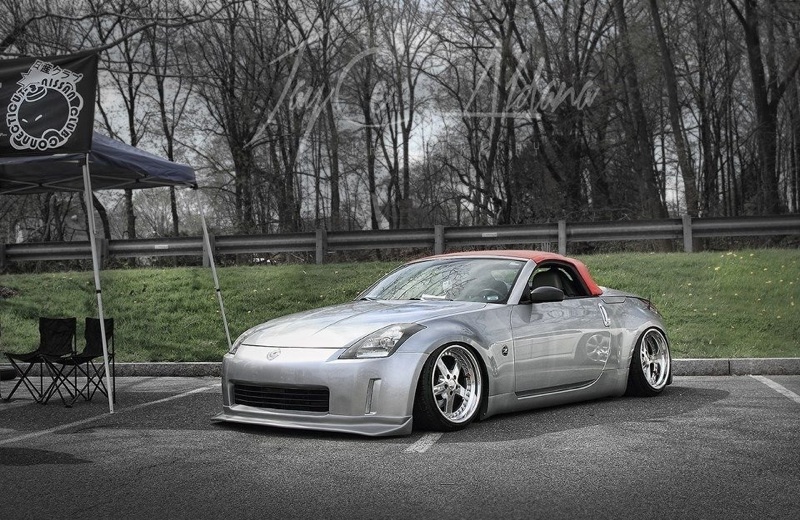 Title should be- Nissan 350z bagged (air- ride suspension).. 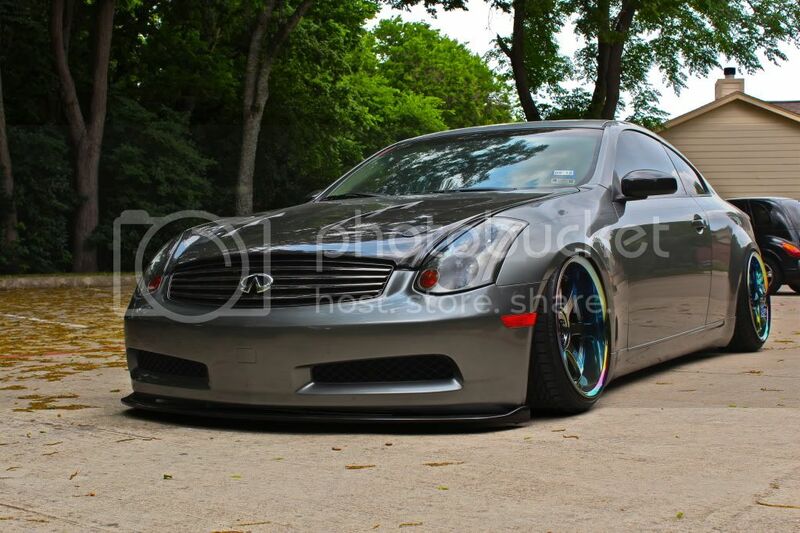 He is a member on this forum akk350z.. I run D2. and I love them, technology on air ride has come a long way in the last 5 years. The use of industrial neumatic quick connect fittings eliminated a lot of leak/ trouble shooting and made repair on the fly under 20seconds flat. Like some said before, this is a "you get what you payed for" mod. if you are going to not get coils and cheap out on the other parts "you are going to have a bad time" /meme. I personally cant drive another custom car w/o them. Every car I do now must have air ride. Management wise, go autopilot v2 or accuair w/ touchpad. You get what you pay for in the air game. The setups that cost more component wise are going to be the ones that are the most reliable (r&d). Make sure your bags are double bellows for a narrower collapsed area. Dont forget a water trap between the compressor and tank either. Poor bag installation is the main cause of blowouts. Lastly, dont take advice from a mini trucker regarding bags. The work, bags and management were all shotty in every setup until Bagyard came out. I a bagged system good for road racing/ drifting? Go here and check it out best bag system money can buy. You converted your coils into bags ? How was it ? How much ? And the difficulty? I have the same coils and want to do the same. Weren't you on a cup kit before? How do you like bags over the cup kit? I finally got my bag over setup complete just need time to make a write up. To piece together a bag over setup is about $2k. I have a parts list of what I used with modifications to what I would have done from the lessons I've learned. The setup I have the list for is bout 50x better than what universal air gives you and $500 cheaper. I dont have the cleanest setup and I have some leaking issues from my gauges but other than that im happy with it. Heres a pic of her laid out. im all fwy and neighborhood traffic. 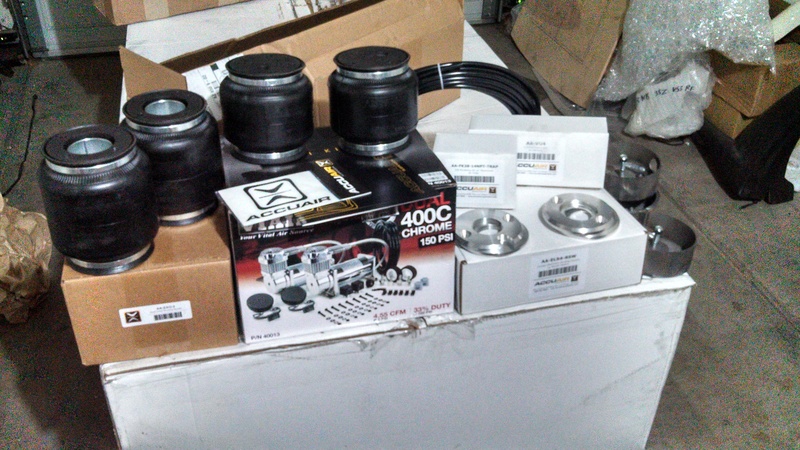 about to install accuair e level in my 300 vipd car next week.. w the new bumper and need for moar lows on the z.. and after what ive learned installing air in my daily.. i dont see any reason not to run air on a sport suspension as long as its on coils. 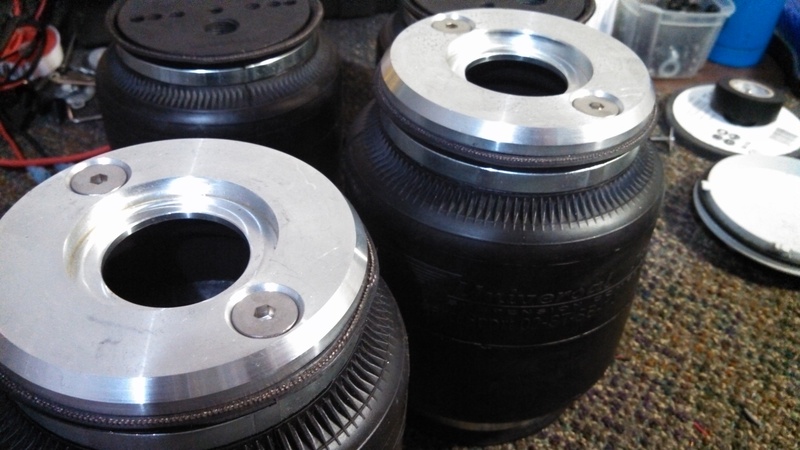 if you run air over coild, you can acheive a stiff spring rate w a vry feathery progressive feel.. you seat the bag farther down the shock body, keep it closer to fully aired in standard driving mode.. and simply let the air out at shows..
you wont get as much lift, but still enuff to help w curbs. but dont expect it to get you into crazy driveways..
i will most certainly be looking back into this for next show season... a z is a car no one else is ever in w me.. no sense using an expensive leveling system since its not a daily for me.. never go manual, but still a dakota digital pressure based system would be fine i assume. I just installed a custom set up. switchspeed managment, airlift struts in the front and universal bags in the rear. I will be posting a somewhat build thread soon. 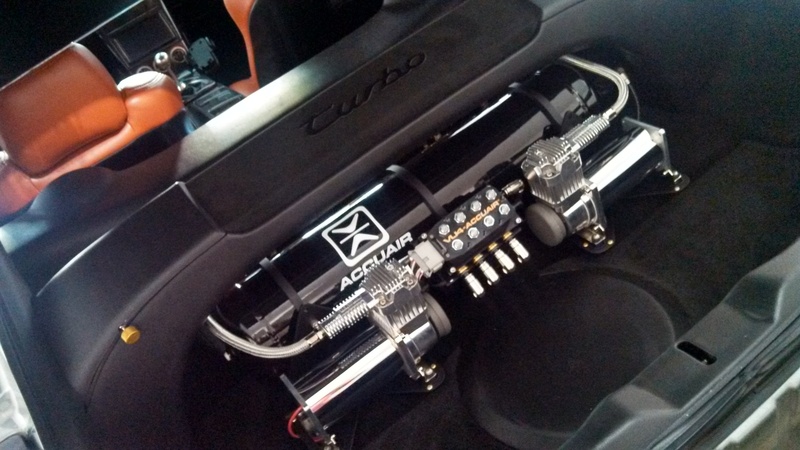 looking back on this thread... its funny how things evolve..
both my cars are sponsored by Accuair now.. and I worked w Zack at UAS to have custom threaded billet bag mounts made to actually thread onto my Stance coilover bodies. eLevel Rocker w Exo mount, UAS bags,, getting ready for my install next..
Im with MUZZY now on this.. EVERY car i do will have leveling air suspension over coilovers on it. considering bagging my z... I don't track it or anything so performance is no issue or restricting for me. 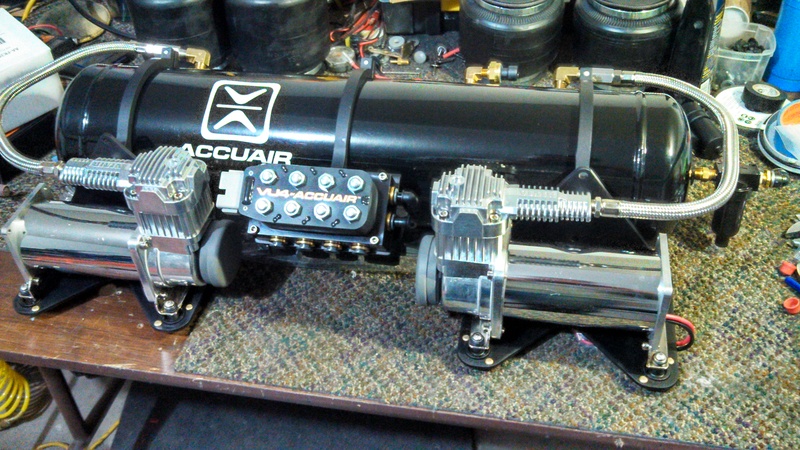 I've seen the bag riders site and it appears I can get everything I need with accuair v2 management for about 2000 with the UAS front and rears to go over my d2 coil overs... any thoughts on UAS? experiences? anything I should look out for?